For the first time ever, GP surgeries can use innovative appointment booking technology to launch their winter flu immunisation programme to increase patient uptake resulting in greater cost-efficiencies and revenue streams for individual practices. 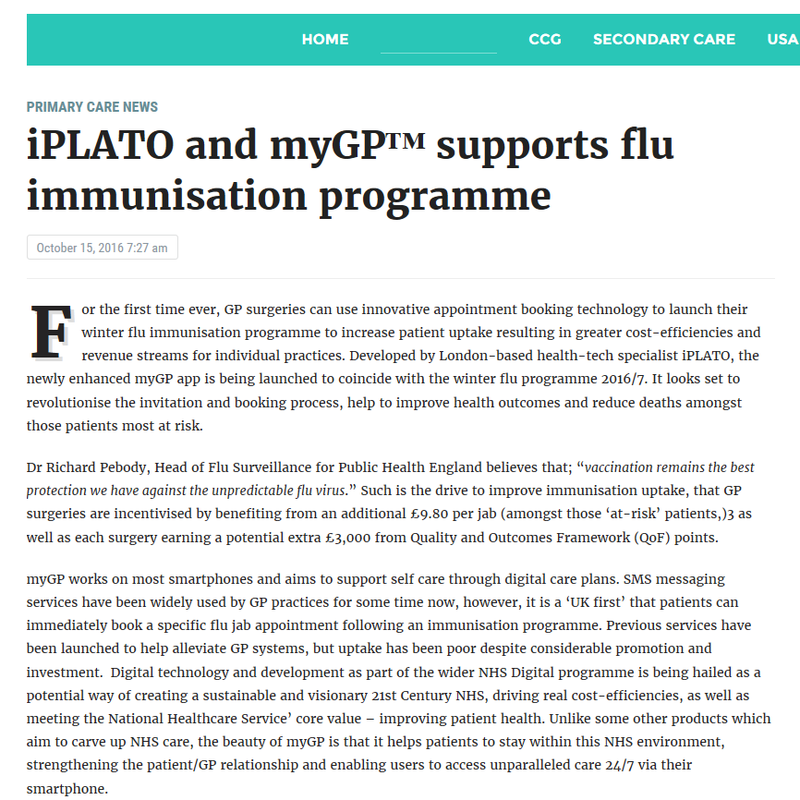 Developed by London-based health-tech specialist iPLATO, the newly enhanced myGP app is being launched to coincide with the winter flu programme 2016/7. It looks set to revolutionise the invitation and booking process, help to improve health outcomes and reduce deaths amongst those patients most at risk. A GP practice can select and target patients who are eligible for the flu jab from their database. 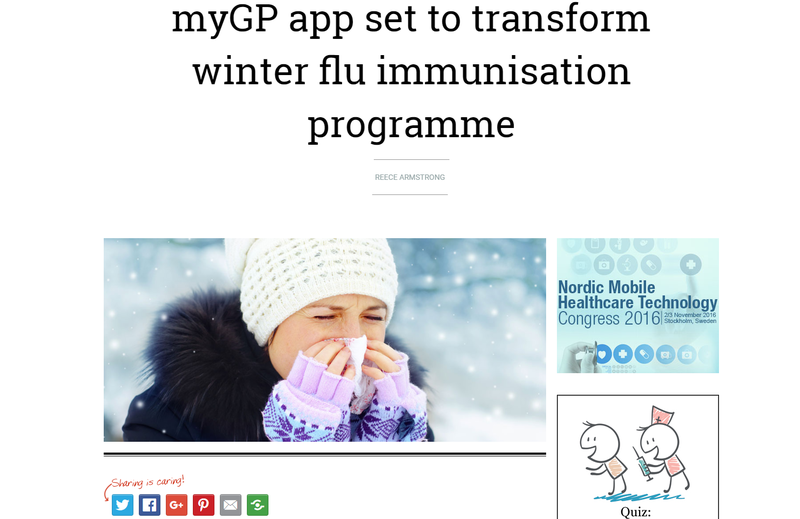 Then, they are sent an SMS-message to book a flu jab by downloading or updating the free myGP app to book their appointments remotely via their smartphone, with no effort from the practice team. 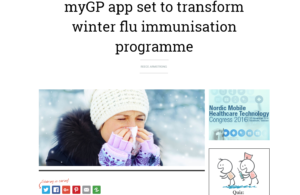 myGP seeks to complement the directives that are currently being implemented by NHS England, to communicate the importance of avoidance of flu amongst the 18-20% of the UK population who should be protected via a yearly jab1. Those most at risk include all men and women aged 65+, pregnant women, as well as children and adults with an underlying health condition – it is believed that if around 12m people eligible had the vaccine, it could prevent up to 6.3m episodes2. Dr Richard Pebody, Head of Flu Surveillance for Public Health England believes that; “vaccination remains the best protection we have against the unpredictable flu virus.” Such is the drive to improve immunisation uptake, that GP surgeries are incentivised by benefiting from an additional £9.80 per jab (amongst those ‘at-risk’ patients,)3 as well as each surgery earning a potential extra £3,000 from Quality and Outcomes Framework (QoF) points4. myGP works on most smartphones and aims to support self care through digital care plans. SMS messaging services have been widely used by GP practices for some time now, however, it is a ‘UK first’ that patients can immediately book a specific flu jab appointment following an immunisation programme. Previous services have been launched to help alleviate GP systems, but uptake has been poor despite considerable promotion and investment. Digital technology and development as part of the wider NHS Digital programme is being hailed as a potential way of creating a sustainable and visionary 21st Century NHS, driving real cost-efficiencies, as well as meeting the National Healthcare Service’ core value – improving patient health. Unlike some other products which aim to carve up NHS care, the beauty of myGP is that it helps patients to stay within this NHS environment, strengthening the patient/GP relationship and enabling users to access unparalleled care 24/7 via their smartphone. Winter is a notoriously busy time for both primary and secondary care with services stretched. Transforming access to immunisation programmes and encouraging take-up of such services offers obvious advantages to patients, but it also benefits commissioners and tax payers alike by reducing repeat GP visits and at worse, admissions to A&E services. Tobias Alpsten, CEO, iPLATO comments; “Research shows us that no other electronic channel elicits replies as quickly as SMS messaging, in fact, 53% of people respond to a phone message within 60 minutes5. Mobile phone penetration crosses both the socio-economic and age divide, with 8 out of 10 people aged between 65-74 years of age owning a mobile device6.